Before my tenure working for the government, I was employed at a small startup company. I had good relationships with all of my superiors in the organization. Even though I was not that high on the totem pole, I felt that my opinions and ideas were heard and that I was respected. I worked hard for the company and enjoyed the work I did. However, having just gone from a dual- to a single-income household after the birth of my first child, my family could no longer afford to live on the salary I was being paid. A government position that was offered to me paid substantially more and had much more generous benefits. It is not that the startup I was working for was stingy. On the contrary, they were very generous with their resources. It was simply a matter of the company having relatively limited resources as a small startup and not being able to compete with the salary and benefits being offered to me by the government. As my days were winding down with my soon-to-be-former employer, my family and I were preparing to make a move from Austin, Texas, to Anchorage, Alaska, where my first assignment with the government would be. Just days before our belongings and car were scheduled to be packed, picked up, and shipped to Alaska, I had a heart-to-heart talk with my then-supervisor. My supervisor was not only wise, but someone whom I respected; she was highly educated, accomplished, and ambitious. She was also an excellent teacher who knew when it was safe to let me fail and when she needed to step in, as she mentored me during my time working with her. She saw my potential, which led to promotions and additional responsibility. She was a person whose opinion I trusted. Therefore, my heart grew heavy when my supervisor counseled me that working for the government would likely cause me to feel stymied and unfulfilled due to the enormity of the bureaucracy. I did not doubt my supervisor’s warnings, but I was caught between a rock and a hard place; I chose the golden handcuffs of the government over the stress of not being able to make ends meet with my young family. While I do not regret making that decision, the forewarning my supervisor gave me about working for the government was correct—I felt thwarted and unfulfilled most of the time. What’s more, the fact that I felt thwarted and unfulfilled was not because of the work itself. Indeed, much of the work was interesting and satisfying. But again, as my supervisor foretold, it was the suffocating bureaucracy that made an otherwise interesting job insufferable. And I was not alone in my suffering; I knew scores of people who were disheartened due to the stifling bureaucracy, many of whom eventually quit over it. On the other hand, there were plenty of people who thrived in government bureaucracy, as they learned to navigate it and manipulate it to their advantage. And there were some for whom the bureaucracy seemed almost invisible, as they were able to ignore it without consequence. Formal or informal bureaucracy exists in every organization. The larger and older an organization, the more bureaucracy it tends to have. Like the slow and steady formation of stalagmites, bureaucracy is a naturally occurring phenomenon in human systems. Bureaucracy is the codified responses, in the form of systems, structures, policies, and procedures to environmental conditions, which provide organizational predictability, consistency, and effectiveness. Over time, environmental conditions change, but the bureaucracy often does not, creating a disconnect between how an organization is operating and the environmental signals. Given that the maintenance of bureaucracy requires people who have a vested interest in preserving the status quo and in whom authority is vested to enforce the organizational systems, structures, policies, and procedures, bureaucracy is self-perpetuating and, therefore, difficult to dislodge. Having some codified systems, structures, policies, and procedures is not inherently bad. However, a point of diminishing returns is met when the bureaucracy is no longer responsive to the environment, effective, and consistent with organizational values and mission. This is the paradox of bureaucracy; it is born out of a will to be organizationally predictable, consistent, and effective, but eventually, it has the opposite effect. It is for this reason that organizations must build solvents into their systems, structures, policies, and procedures to periodically decalcify the bureaucracy to keep it at minimally necessary levels so the organization can remain responsive, effective, and congruent. This starts by selecting the right people to oversee the bureaucracy. The autocrat: The autocrat is probably the most well-known to people as they are the most prevalent among the ranks of power within organizations. This is no happenstance; autocrats seek power by nature, so it stands to reason that they are going to predominate in positions of power, all things being equal. Autocrats tend to be sticklers for the rules. Not much gets by them. I once had an autocratic supervisor who scolded a colleague of mine for exiting the office and going home during a fire alarm. On the surface, it seems reasonable to expect people to follow the rules during a fire alarm. After all, it is a matter of safety. But in this case, the fire alarm sounded as my co-worker was leaving for the day. He had his coat on and had signed out. What is more, it was near the end of the workday. As the rest of us gathered at our designed rendezvous point, we could see our colleague beyond the gate, driving away. He gave us a playful wave as if to say, “See ya, suckers!” The next day he got a dressing-down from our supervisor for not turning around, coming back into the office, and joining the rest of us. Ironically, had it been a real fire, going back into the building would be the most dangerous thing my colleague could have done. But all of that did not matter to our supervisor. As far as she was concerned, because he was still technically in the building when the alarm sounded, he should have reported to our designated rendezvous point. While autocrats can be unproductively literal about the rules, they do tend to apply the rules evenly. Autocrats often keep a safe emotional distance from their subordinates to avoid being swayed by their personal feelings, in favor of cold binary calculations. Autocrats can be counted on like no one else to uphold and defend the bureaucracy. However, because they seek power and are guided by a paradigm of control, they can be ruthless and unpleasant. Autocrats, while often consistent, reliable, and pleasing to their bosses, prevent more than anyone else necessary change to systems, structures, policies, and procedures. When an autocrat eventually obtains sufficient power to make changes, the changes are often superficial and unresponsive to the environment. The pragmatist: Pragmatism is often considered a sign of intellectual maturity. At their best, pragmatists can use sound judgment and wisdom to navigate the complexities, intricacies, and sometimes inconsistencies in systems, structures, policies, and procedures. Unlike the autocrat, the pragmatist is not a slave to the rules but is also not indifferent to them. The pragmatist seeks solutions that are based on deeper principles than superficial codes and expectations. This behavior is usually not done to undermine the bureaucracy per se but to allow for flexibility and reasonableness to prevail. Thus, the pragmatist is not out to take the system down but to allow it to survive by being informally adaptive. However, despite their best efforts, pragmatists can sometimes be viewed as unfair (e.g., “Why did you apply this rule to me but not to her?). While pragmatists are seldom arbitrary in their calculations, the rationale behind their judgments can be opaque to outsiders at times, leading to a perception that they are inconsistent, unpredictable, and unfair. Pragmatists can also fall victim to expediency. Liberated from superficial absolutes, pragmatists can become unmoored and start to pick and choose how to enforce the systems, structures, policies, and procedures in ways that are self-serving and not based on sound judgment and sage wisdom. This is a dangerous and slippery slope for pragmatists and can lead to their downfall. If autocrats are best at holding up bureaucracy even when gravity is pulling it down, pragmatists are best at allowing bureaucracy to withstand a gravitational pull by introducing informal flexibility into systems, structures, policies, and procedures without changing them per se. The maverick: Mavericks relish in pointing out the inconstancies, imperfections, and inhumanness within systems, structures, policies, and procedures and defying convention. More than anyone else, the maverick can identify and articulate how systems, structures, policies, and procedures can be improved or done away with. Mavericks often eschew the notion of process altogether and end up living by their own rules. Mavericks can get away with this because it is their boldness and effectiveness in skirting the rules that enable them to be high performers and, thus, indispensable, often to the chagrin of the autocrats. When in positions of power, mavericks, driven by a disdain for conformity and restraint, often do not reform the bureaucracy but, instead, ignore it. It is hard for the maverick to see value in trying to improve the systems, structures, policies, and procedures when there is work to be done, after all. Effective work always trumps bureaucracy for the maverick. As leaders, mavericks can be maddening to subordinates who rely on systems, structures, policies, and procedures to make sense of their worlds. The lack of regard for established processes can cause mavericks to be viewed as indifferent and aloof to subordinates. Even if mavericks are not usually reformers themselves, their actions and behaviors can help point the way for those who do want to reform and improve the systems, structures, policies, and procedures. I once worked with a maverick in a highly bureaucratic and dysfunctional organization. The mission of the organization was to get people to work cross-functionally on challenging problems. However, the systems, structures, policies, and procedures the leadership put in place actively discouraged the serendipitous and spontaneous cross-functional interactions that would have facilitated this mission. My maverick friend pretty much ignored the rules and worked with whom he wanted, on what he wanted, and when he wanted. He was almost never at his desk because he was out and about at other people’s desks working with them. He was so effective and well-liked that it would have been pointless and counterproductive for leadership to attempt to rein him in; he knew it, and they knew it. However, his actions were pointing the way for leadership to reform the systems, structures, policies, and procedures. Unfortunately, leaders within the organization were mostly autocratically-minded; they could not imagine scaling my maverick colleague’s behavior across the organization and institutionalizing it. After he moved on from his three-year assignment in the organization, the leadership put in place new and reinforced existing systems, structures, policies, and procedures that undermined the premise of a cross-functional work environment. Had the leadership taken a cue from the maverick, it could have put in place minimally necessary systems, structures, policies, procedures that would have facilitated cross-functional work rather than discouraging it. The maverick showed the leaders the way, as mavericks often do; they just needed to follow his lead. The hustler: The hustler is the person who is not blind to systems, structures, policies, procedures but knows them so well that he/she can find the loopholes, manipulate inconsistencies, and maximize their benefit. Sometimes, the hustler does this for personal gain; sometimes, he/she does it for the benefit of others or the whole organization. When in positions of authority, the hustler can be very effective at getting the bureaucracy to be effective despite itself. Because of this, the hustler often does not want to change systems, structures, policies, procedures because he/she relies on the flaws therein to take advantage of them. At the same time, the hustler is the person who knows the systems, structures, policies, procedures so well—often better than the autocrat—that he/she is precisely the person who knows how they can be reformed and improved. 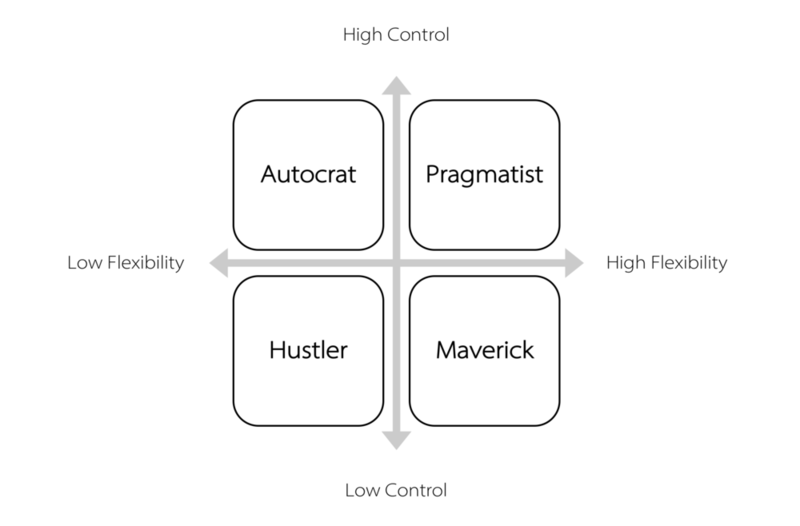 As mentioned previously, the autocrat, pragmatist, maverick, and hustler are archetypes. In reality, most people do not perfectly conform to any one of these four types, and an individual may exhibit characteristics of each. Nevertheless, one type will tend to predominate in a person. While we all may have certain types of leaders that we prefer or dislike, based on our personalities and experiences, the reality is that each of these types and their paradigms of thought play an essential role in creating minimally necessary and effective systems, structures, policies, and procedures within organizations. Keeping bureaucracy to the minimum necessary levels is critical to the sustainability of an organization. On the one hand, trying to keep an organization informal and without any bureaucracy is unnecessary and will undermine the organization’s ability to learn lessons that can be institutionalized and passed on. On the other hand, bureaucracy tends to beget bureaucracy, making it difficult to keep it from growing out of control. There needs to be a constant downward pressure on bureaucracy to keep it from growing unnecessarily—bureaucracy will not self-regulate its size. Thus, keeping systems, structures, policies, and procedures effective, responsive, and congruent takes active work, to define both what the systems, structures, policies, and procedures should be and what they should not be, to keep them from reaching diminishing returns. To this end, the autocrat, pragmatist, maverick, and hustler all have a part to play. Furthermore, there is an approach that can be applied based on these archetypes that will keep systems, structures, policies, and procedures responsive to the environment, limited by their relevance, effective and, consistent with organizational values and mission. The afore-referenced approach is relevant to organizations that already have established systems, structures, policies, and procedures and begins by observing how mavericks behave. Because mavericks’ paradigm is based on effectiveness and efficiency, they tend to find the most direct paths with the least resistance when working. For example, my previously-mentioned maverick coworker almost never communicated via email, spent a great deal of time teaching and learning from others, identified individuals who had skills that he could benefit from and who could benefit from his skills when developing ideas and building them into projects, and facilitated weekly informal get-togethers during lunch for people to showcase their skills. All of this helped to create an environment conducive to cross-functional collaboration and innovation. My maverick friend was able to do these things in spite of the existing bureaucracy and not because of it. His actions showed how the organization could encourage norms of productive behavior to become cross-functional at scale. Once the productive behaviors of mavericks have been identified, an opportunity for dialogue opens up for leaders, during which they can consider how to modify, remove, or add systems, structures, policies, and procedures to improve the congruence between the organization’s behavioral profile and its desired outcomes. Not everything mavericks do can be scaled, and not everything they do is productive. However, observing the behavior of people who ignore convention in favor of effectiveness and efficiency can provide valuable lessons for leaders who are sometimes disadvantaged by their distance from the work that is occurring, which can cause unproductive abstraction in the development of subsequent systems, structures, policies, and procedures that at their best are benign and at their worst act as malignant cancers to the organization. Using the behavior of mavericks to help ground systems, structures, policies, and procedures also does not mean that everyone should be encouraged to act like a maverick. Mavericks are rare, and they have temperaments that most of us do not share. While genuine mavericks should be tolerated in organizations—so long as they are adding value through effectiveness and efficiency, even if they’re shunning convention and conformity—not everyone should be expected to behave like mavericks. However, the productive mavericks should not be marginalized, as they will continue to act as barometers for the organization—i.e., the more out of sync the organization is with how mavericks are behaving, the likelier it is that the organization’s bureaucracy is ineffective, unresponsive, and out of sync with its mission and values. Once systems, structures, policies, and procedures have been audited against maverick behavior in an organization, the other three types of leaders must also be allowed to play their parts. The role of autocrats in organizations is important. Autocrats help keep organizations on the straight and narrow. While it can be difficult for pragmatists, mavericks, and hustlers to coexist with autocrats, this tension is a good thing. If an organization is going to have formal systems, structures, policies, and procedures, there must be people who care enough about following those systems, structures, policies, and procedures to give them life. The problem with the overwhelming number of organizations is that they have too many autocrats in positions of authority. When autocrats predominate in positions of authority, they prevent change within the organization as they seek to control it. If they do allow change, it is usually based on their perceptions and on their terms, which are often inconsistent with the types of systems, structures, policies, and procedures that are effective, responsive, and congruent. There are three reasons why autocrats tend to have positions of authority. Firstly, autocrats enjoy control because they often have a low tolerance for ambiguity. This low tolerance for ambiguity causes them to seek out power so they can exercise control and reduce ambiguity for themselves. Secondly, autocrats tend to be very good subordinates. Autocrats follow the rules, do not stir the pot, and seek to please their superiors; compliant subordinates tend to get promoted. Thirdly, autocratic tendencies can be latent in people until they are given some authority, which awakens these tendencies. It is important that people in positions of authority be pragmatists, mavericks, and hustlers as well. No more than a plurality of leaders should be autocratically-minded in an organization. Any more than a plurality of autocrats would make it difficult to keep systems, structures, policies, and procedures at minimally necessary levels. Pragmatists must be allowed to occupy positions of power because they introduce essential flexibility into bureaucracy. Hustlers must be allowed to occupy positions of power because they help to keep things moving in an organization where autocrats, pragmatists, and mavericks cannot because hustlers know the bureaucracy well enough to use it against itself. In summary, mavericks, through their behavior, help identify minimally necessary systems, structures, policies, and procedures, and all archetypes of leader must be allowed into positions of authority. The true power of this approach is in having a good diversity of thought and behavior among leaders to keep an organization’s bureaucracy in check. In addition to a diversity of thought and behavior among leaders, it is essential that organizations undertake regular audits of their systems, structures, policies, and procedures. These audits are aided by having autocrats, pragmatists, mavericks, and hustlers involved in the vetting. As I previously stated, bureaucracy begets bureaucracy, even when the above-described formula is applied. Also, it does not take long for an organization’s bureaucracy to move from minimally necessary to hinderingly cumbersome. Autocrats will tend to resist revisions to systems, structures, policies, and procedures that are not done on their exclusive terms, that reduce their power, or that increase ambiguity. This is another significant reason why it is important to prevent autocrats from occupying a majority of positions of power, as they are likely to form a block and overrule attempts to keep bureaucracy in check and, if anything, will attempt to grow it. One very effective method of conducting audits of systems, structures, policies, and procedures is to use a modified version of the Five Whys Technique. The Five Whys Technique was developed by Sakichi Toyoda, the founder of Toyota. The technique is meant to start with a problem statement about which five successive whys are asked, helping to get to the root cause of the problem. The Five Whys Technique is not perfect and is limited by the facts at hand, the number of relevant participants in the activity, and a willingness on the part of participants to be open-minded and honest. These obstacles notwithstanding, the Five Whys Technique can be a powerful tool to produce constructive and productive dialogue. To modify the Five Whys Technique for evaluating elements of bureaucracy, instead of starting the exercise with a problem statement, the exercise is begun with a single system, structure, policy, or procedure. Five whys are then asked successively with the goal of identifying the root purpose of the specific system, structure, policy, or procedure. Sometimes, more or fewer than five whys can be applied to reach the root purpose. Once the root purpose is identified, it can then be audited for effectiveness, responsiveness to the environment, and congruence with the organization’s mission and values. Policy: Any email that is meant for distribution to the team must be authorized by the team supervisor before being sent out. 1: Why does the policy exist? To prevent too many emails from going out to the team.Why do too many emails need to be prevented from going to the team? Because the team supervisor does not want the team to be preoccupied with email. 3: Before the creation of the policy, was the team preoccupied with email? The team spent about 60 to 90 minutes a day reading and replying to emails. 4a: Does 60 to 90 minutes a day constitute preoccupation with email? Sixty to 90 minutes is about how much time people on other teams spend on email. 4b: How much time does the team spend now on email? The team still spends 60 to 90 minutes a day reading and writing emails. 5a/b: Has the team raised concerns that they are spending too much time on email? No. In the above example, which is contrived for effect, the policy was identified as being ineffective as the employees were spending just as much time on email, unresponsive to the environment as the employees did not feel they were spending too much time on email as 60 to 90 minutes a day was standard for the rest of the organization and inconsistent with the organization’s stated value of trusting employees to use their time effectively. After question three, there was an opportunity to ask two whys. Thus question four became two questions, which could be answered in question five. This forking is useful as some questions will have multiple answers that need to be addressed. If forking becomes excessive and there are dozens of questions and answers, the exercise is likely to lose its usefulness. However, allowing forking two to three times adds necessary flexibility to the exercise. The answers to the above questions also imply that information was available to answer each of the whys. The information required to answer the questions above the way they were answered would have required the inclusion of team members and perhaps others from the organization outside of the team. The Five Whys Technique is not something that can be used in isolation; the exercise becomes meaningless if done by only one person. And there are limitations to the exercise as well. Sometimes, answers will be subjective. Not all of the information will always be available. And power dynamics in the group can influence how individuals choose to answer questions. These drawbacks notwithstanding, at its best, the Five Whys Technique applied to auditing bureaucracy will allow for systems, structures, policies, and procedures to be evaluated for their effectiveness, responsiveness to the environment, and congruence with an organization’s values and mission. Ultimately, those are the three things against which all systems, structures, policies, and procedures should be evaluated: Is it effective? Is it responsive to the environment? Is it in harmony with the mission and values of the organization? A “no” to any one of those questions should call into question the existence of a given system, structure, policy, or procedure. An organization’s bureaucracy, with its accompanying systems, structures, policies, and procedures, must be effective, responsive to the environment, and consistent with the organization’s mission and values. An organization cannot take on a conscious or subconscious philosophy of form over function and expect to be a sustainably productive, profitable, collaborative, and innovative organization. Even if an organization thrives for a time under conditions of excess bureaucracy, its chickens will eventually come home to roost as its systems, structures, policies, and procedures cause organizational atrophy and eventually rot. Leading indicators of organizational atrophy and rot are signs of low morale, disengagement, and attrition among employees. A lagging indicator is often slumping profits. Because many organizations are so focused on the bottom line, fatal organizational atrophy and rot may have set in by the time alarm bells start going off for senior leaders. It is precisely for this reason that organizations—especially senior leaders—must have their fingers on the pulse of what’s going on in the organization beyond profit margins. Leadership that is diverse in its paradigms of thought will be better in touch with the organization. Autocrats, pragmatists, mavericks, and hustlers all bring unique points of view to how work should be conducted. It is this diversity of thought that enables organizational leaders to remain aware of and responsive to the internal and external environments to effectuate meaningful and timely change in order to ensure sustainable productivity, profitability, collaboration, and innovation within the organization.